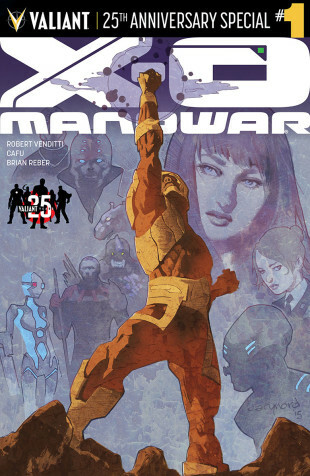 The Fellowship was fortunate enough to obtain a copy of X-O MANOWAR: VALIANT 25TH ANNIVERSARY SPECIAL #1 from Valiant Entertainment. Robert Venditti writes, CAFU draws and Brian Reber colors. This is not a story about Aric of Dacia. It’s a story about a little girl named Shanhara, who was very ill. Her father did everything he could to help her, experimenting with plant-machine hybrid technology. But once she was connected to the device, she couldn’t be removed, and it eventually merged with her completely. The result formed a suit of armor that could bond with its wearer, fulfilling a destiny that spans the galaxy. The mega-powerful X-O Manowar armor was once a scared little girl. It’s an unexpected way to take the story, and it’s extremely well told here. Shanhara’s tale is told over unmeasurable amounts of time as well (time references include “long ago” and “millennia later”), which really adds to the tragedy of her story. The art is also beautifully done, especially in the careful avoidance of words – much of the story is told with just the visuals, and it’s really nicely done. If a touching story about a serious piece of military hardware is what you’re looking for, you’ll love this one. If not, well, it’s still an amazing story. Pick this one up. X-O MANOWAR: VALIANT 25TH ANNIVERSARY SPECIAL #1 is available now at your FLCS or at valiantuniverse.com.